Or at least that's what she went by. She always had as long as I knew her. Of all the people I knew who worked in and around the World Trade Center, I am kind of amazed that I only knew one person who perished, or was even injured, on September 11th. The irony being that Kit lived in Colorado and had a training session in New York, that happened to be on the 106th floor of north tower. Her remains have not been found. Kit was younger than I, but I was really friends with her brother and have known him since the 4th grade. She would hang around whenever we would play - as kid sisters tend to do. 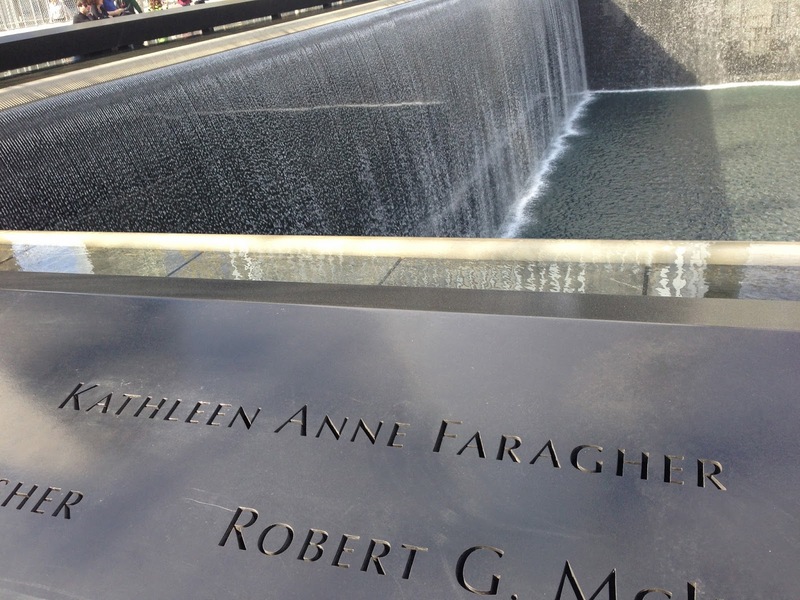 When we were in NYC a few weeks ago, we purposefully made our way down to the 9/11 Memorial site. Besides wanting to see it (thoughts on that in another post), I was really wanting to see Kit's name. Of the almost 3,000 names on the panels, you start to think of how many people just look over them as a blur. The printed names are to remember them - and as I looked at them, I started thinking. And probably too much. Outside of family and friends, how many people ever saw Kit's name there? Or looked at it twice? Kit was not married and had no children. Her brother had his children after 9/11 (even naming his son 'Kit'), though her sisters had some kids prior to her death. Kit's father just passed away a few weeks ago, her mother years ago. It kind of hit me that in another generation or so, anyone who knew Kit would be gone. Anyone else would cease to know her as a person, and only a name on a panel. That is, if they took the time to even look. Of course, then I started thinking, that this is true of all of us. Save some remarkable people, we are just passing through here, with few people to remember us shortly after we are gone. We might be a name on a census or somewhere on ancestry.com, but we are blips in time. Deep down, I already knew this. I've been watching Cosmos! Still, I think that is what made it more important to head to the 9/11 Memorial and see Kit's name and to touch the letters. She may have been here for a moment, but she affected quite a few people while here.